Today, I hope to finish Beyond the Darkness. I'd love to read more for the read-a-thon but I just don't know if that's going to happen. We'll see... You can see my daily page count over on the right sidebar. I've also completed three mini challenges: Zombie Apocalypse, Book Title Sentence, and Suspenseful Paragraph. 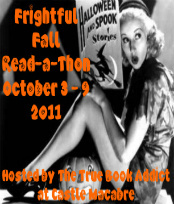 Don't forget to enter my mini challenge (click here) for a chance to win a book of your choice!